Recording King's Dirty 30's Resonator delivers tons of classic style and a vintage resonator tone perfect for old-school blues and slide players. 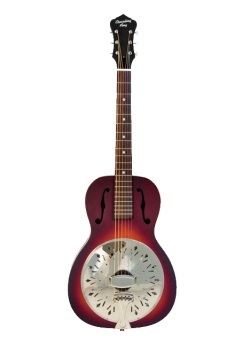 The single 0 size resonator drips with vibe, from the f-holes and tailpiece to the classic sunburst matte finish. Traditional resonator sound is delivered from a hand-spun 9.5” cone in a pedestal soundwell. Soundposts surround the circle of the soundwell and the cone vibrations are free to bounce within the full cavity of the body. The f-holes are placed to optimize bass and treble frequencies as they exit the body for the perfect dry, throaty resonator tone.